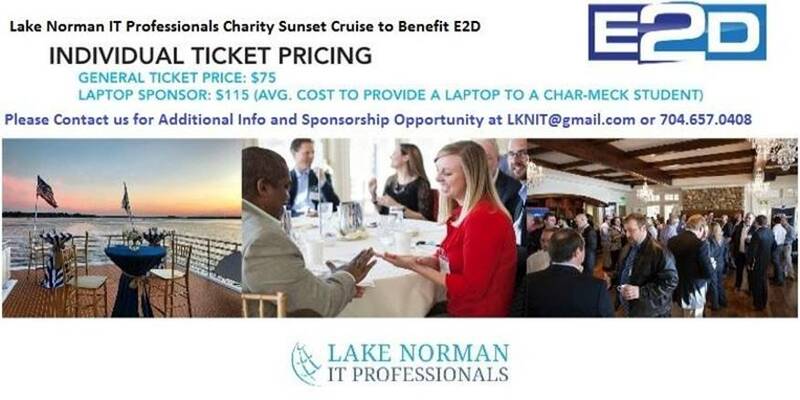 Please join us on the brand-new yacht “Carolina Grace” for an extraordinary networking event to benefit E2D. Together we can help close the digital divide! · How can all kids in our school do their homework and projects successfully if some of their families are too poor to own digital technology? · What are we going to do about it? So far, E2D has closed the digital gap for over 1,800 families, in our community! Unfortunately, E2D estimates that need in Charlotte totals at least another 24,000 student homes, that need laptops and internet access to be successful with basic school tasks. Well together in addition to enjoying a sunset cruise, we can network to celebrate E2D’s Impact, raise awareness, raise money and support this mission within our very own community. · Tickets for the benefit cruise are $75. That’s right! You can also give more with our Laptop Sponsorship! The average cost of providing a laptop to a Charlotte/Mecklenburg student is $115. You are welcome buy as many Laptops Sponsorships as you like. Please contact us for details on sponsorship or for additional information by email LKNITP or by calling (704) 567-0408.Thanks for your help and we look forward to the cruise on the Carolina Grace!